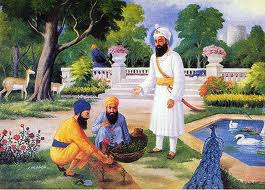 Guru Har Rai Punya Divas is Coming on 24 October 2012. 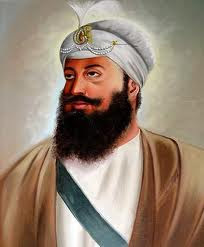 Guru Har Rai (January 31, 1630 – October 20, 1661) is the seventh of ten living Gurus of the Sikhs.He was born at Kiratpur.He received his name from his grandfather, Guru Har Gobind Sahib.He was the son of Baba Gurdita Ji and Mata Nihal Kaur Ji(also known as Mata Ananti Ji). He was married to Mata Kishan Kaur Ji(Sulakhni Ji), daughter of Sri Daya Ram Ji of Anoopshahr (Bulandshahr) in Utter Pradesh.He had two sons: Sri Ram Rai Jiand Sri Har Krishan Sahib Ji (Guru). He also had a daughter named Bibi Anoop Kaur Ji. He had one elder brother Dhir Mal. Dhir Mal turned out to be disloyal and disobedient. 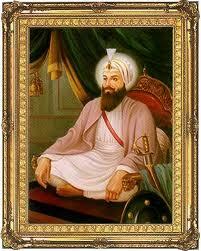 He had some influence in the court of Mughal Emperor and was in communication with the Guru’s enemies. When Guru Har Gobind moved to Kiratpur, Dhir Mal with his mother remained at Kartarpur and took possession of the Guru’s property and the priceless original copy of the Adi Granth. He thought that as long as he had its possession, the Sikhs would look upon him as their religious leader. Dhir mal refused Guru’s invitation to come to Kiratpur on his father’s death. Guru Har Gobind nominated Har Rai, younger brother of Dhir Mal, as his successor before he departed for the heavenly abode.Guru Har Rai Sahib loved peace but he never disbanded the armed Sikh Warriors (Saint Soldiers), who were earlier maintained by his grandfather (Guru Hargobind Sahib). 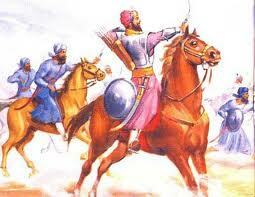 He continued to maintain a cavalry of 2,200 soldiers of his grandfather throughout his Guruship. 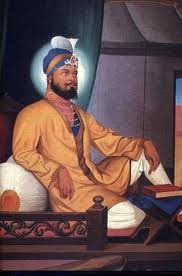 He further boosted the military spirit of the Sikhs, but he himself never indulged in any direct political or armed controversy with the contemporary Mughal Empire. Once, on the request of Dara Shikoh (the eldest son of emperor Shahjahan), Guru Sahib helped him to escape safely from the bloody hands of Aurangzebs armed forces during the war of succession. “The Word is the Guru, and the Guru in the Word, and in the Word is the essence of ambrosia.”A devout Sikh called Bhai Gonda used to stay with the Guru. He was a saint in thought, word and deed. Guru ji was pleased with his sincere devotion and asked Bhai Gonda, go to Kabul to instruct the Sikhs of that place to worship the true Name, to preach the Sikh faith, feed holy men and pilgrims with the offerings received and to send the remains to Guru for the upkeep of the Lanagar. Although Kabul was a foreign country and there was danger from Muslim bigotry living at that place, Bhai Gonda cheerfully accepted the task . On arriving at Kabul he built a Gurdwara and followed Guru’s instructions. One day, while Bhai Gonda was reciting the Japuji Sahib, he felt as if he was clinging to the Guru’s feet. He was in such a state of abstraction that he became unconscious. He was absorbed in the presence of the Guru like a drop of rain in the ocean. The Guru was aware of Bhai Gonda’s state. He sat firmly on his throne keeping his feet together. 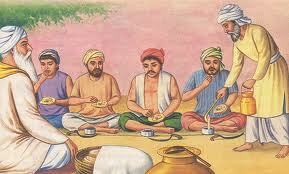 At mid-day, when the food was served, Guru did not respond. When the request was repeated after an hour later, he still remained silent. After a long interval, the request was repeated, but the Guru did not reply. Several Sikhs gathered together and were about to make a representation to the Guru, when he finally spoke and explained that Bhai Gonda is in Kabul had clasped the feet of the Guru. How could he remove the same and take his food? He informed that he was waiting for the conclusion of his meditation and obeisance. Bhai Gonda did not awake from his trance before twilight, and it was the time when the Guru felt free to take his meal.Once a man called Bhai Kala brought two of his nephews to the court of Guru Ji. The boys were called Sandlu and Roopa. Both of them played on their stomachs like on drums. 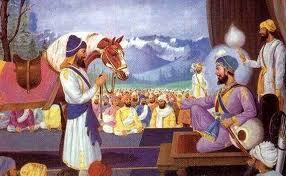 Guru Ji was delighted and granted them estates. Later their descendents formed the princely states of Patiala and Nabha. 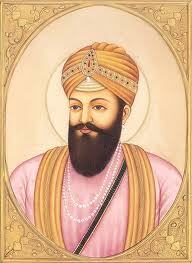 Guru Har Rai Sahib faced some serious difficulties during the period of his guruship. The corrupt massands, Dhir Mals and Minas always tried to preclude the advancement of Sikh religion. After the death of Shah Jahan, the attitude of the state headed by Aurangzeb towards the non-muslims, turned hostile. The Emperor Aurangzeb made an excuse for the help rendered to prince Dara Shakoh by Guru Sahib during the war of succession and framed false charges against Guru Sahib and summoned him to Delhi.Ram Rai appeared at the court of the Emperor on behalf of Guru Sahib. He tried to clarify some misunderstandings regarding Guru Ghar and Sikh faith created by Dhirmals and Minas. Yet another trap, which he could not escape, was to clarify the meaning of the verse “The Ashes of the Mohammadan fall into the potter’s clot, it is molded into pots and bricks, and they cry out as they burn”. Ram Rai, in order to please the emperor and togain sympathy replied that the text had been needlessly corrupted by some ignorant person and replaced the word Musleman with word Beiman (dishonest). (The actual meaning of the verse is that the human soul is not bound to the physical structure or the body of a person. The physical material of the bodies of both Hindus and Muslims face the same fate and it is a universal truth. The soul leaves the body immediately after the death and it does not remain in the grave waiting for doom’s day. And the earth consumes the body-material in due course of time) It is a rational and scientific view of Sikhism. It was also reported to the Guru that Ram Rai had also worked miracles in the Mughal’s court against his father’s direct instructions. Sikhs are constrained by their Gurus not to believe in magic, myth or miracles.Due to this reason, Guruji excommunicated Ram Rai from the Sikh Panth and never met him, through the later pleaded repeatedly for forgiveness. 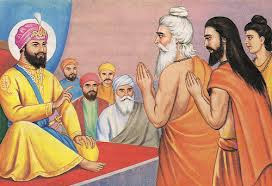 Thus Guru Sahib cautioned the Sikhs against any alteration of original verse in Guru Granth Sahib and the basic conventions set up by Guru Nanak Sahib.Knowing that the his end was near, Guru Har Rai Sahib installed his younger son Har Krishan as the Eighth Nanak and passed away on Kartik Vadi 9 (5 Kartik), Bikrami Samvat 1718, (October 20, 1661) at Kiratpur Sahib.